Journalists have failed to respond adequately to the challenge of the Internet, with far-reaching consequences for the future of journalism and democracy. 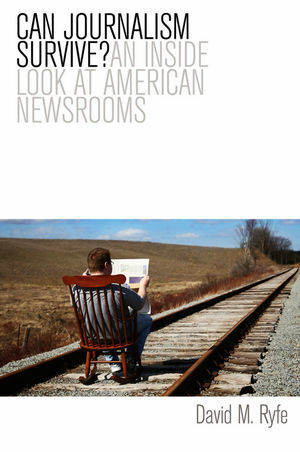 This is the compelling argument set forth in this timely new text, drawing on the most extensive ethnographic fieldwork in American newsrooms since the 1970s. David Ryfe argues that journalists are unable or unwilling to innovate for a variety of reasons: in part because habits are sticky and difficult to dislodge; in part because of their strategic calculation that the cost of change far exceeds its benefit; and in part because basic definitions of what journalism is, and what it is for, anchor journalism to tradition even when journalists prefer to change. The result is that journalism is unraveling as an integrated social field; it may never again be a separate and separable activity from the broader practice of producing news. One thing is certain: whatever happens next, it will have dramatic consequences for the role journalism plays in democratic society and perhaps will transform its basic meaning and purpose. Can Journalism Survive? is essential and provocative reading for all concerned with the future of journalism and society. David Ryfe is Associate Professor of Journalism at the University of Nevada, Reno. "One of the finest and more in-depth portrayals of the struggle of newspapers to reinvent themselves." "Ryfe offers compelling evidence that the success of new forms of public interaction - social media, blogs, crowdsourcing, data mining, etc - can, and are, mobilising local communities in the interests of greater transparency and accountability. He identifies a key role for journalists in this process: "Crowds need people who can catalyze the community, organize its work in granular form and put the pieces together when finished." And although he accepts that there are some journalists, maybe the majority, who will find it difficult to accept this new gatekeeping role, he is adamant: this is the future, whether they like it or not." "This is a book which demands attention within the media industry and with all those interested in the development of society in a changing social era." "For all our academic debates about what journalism should do to survive in the digital age, David Ryfe has done the invaluable research needed to have this discussion in the first place: he looked at what journalists do to make it work, and why." "David Ryfe has written an accessible and thoughtful book about US press journalism as it faces the drawn-out challenge of finding new business models in the face of the digital revolution. With its first-person style and lively ethnographic detail, it is written to appeal to a new generation of students facing many professional uncertainties." "'There will always be newspapers,' journalists told David Ryfe a half dozen years ago. Now they are not so sure what that could possibly mean, as Ryfe shows in this study of a profession in crisis. A masterful portrait of three different newsrooms close-up, warts and all, this is an original, readable, and important work." Major new study of the impact of digitalization on journalism. Based on in depth ethnographic research in a range of newsrooms in North America. Presents a compelling case that journalists have failed to respond to the changing news environment and considers the reasons for this inertia. Fills a huge gap for a book on the contemporary news media based on research and not just speculation.